A number of years ago I was a resident of the strange and slightly forgotten town of Woolwich in South East London. Woolwich is a total mix of nationalities and cultures, which don’t ever seem to integrate with one another. It is also in a state of almost continuous construction and destruction. In the two years in which I lived in Woolwich, there was never a day when I didn’t hear the sounds of rubble being drilled, or the movement of cranes over the skyline. It was on one of these noisy, early December mornings that something subtle yet out of place caught my eye. 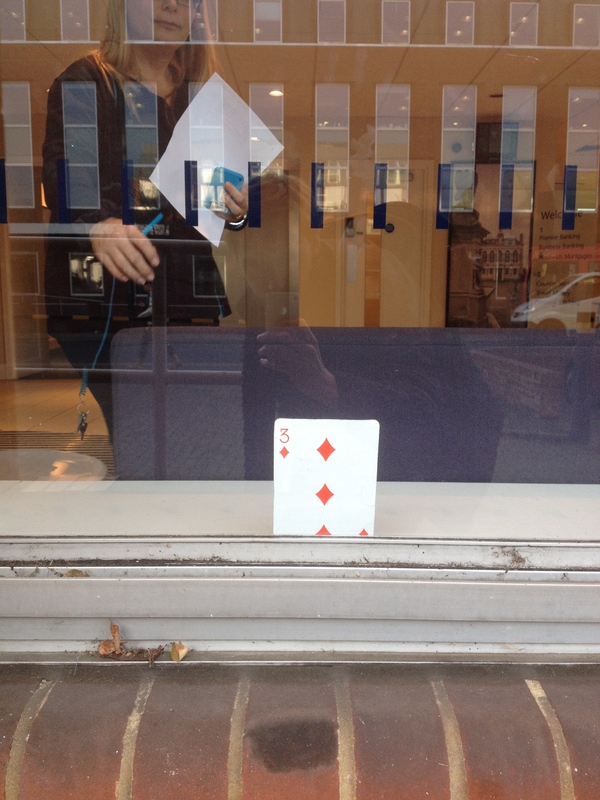 In the main Woolwich town square, propped up in the window of a bank, I noticed a very small, children's alphabet card. The windows reached from the floor to ceiling, so the card was very near to my foot level. It showed the letter ‘M’ accompanied by an image of a small, brown mouse, bearing the inscription ‘Merry Christmas’. With a love for these kind of poetic placements of objects I took a quick photograph and carried on, not thinking much more of it. A few days later I was walking past the bank again at a similar time of day, when I noticed another card in the same place in the window. This time a letter ‘B’ with an image of a bird, carrying no inscription. It was at this point that my interest was aroused. I started to ruminate. My first thought was that a bored child, their parent at the cash desk, had gone around the bank, alphabet cards in hand, posting them into various post box like spaces while their guardian was unaware. And maybe then the staff or cleaners, as they found them one by one, propped them up in the front window in the hope that the family walking past may see them and be reunited. They had decided to write the Christmas message as a humorous after thought. We then moved away from Woolwich when our flats were demolished as part of redevelopment (as I say constant destruction), and I thought not much more of it. That was until a few months ago. I needed to widen my search. 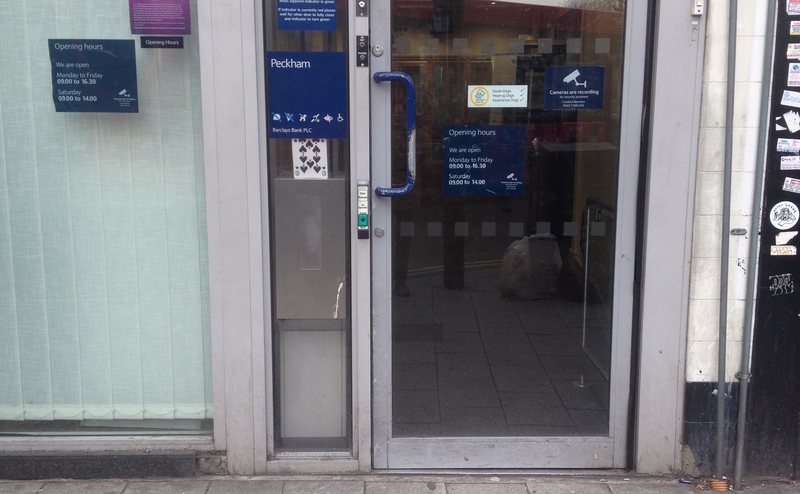 On the same day, when I arrived at my destination of travel, I searched out another Barclays bank. When I reached the front windows I was stunned. Another single playing card, the Three of Diamonds, was propped against the front window. It was here that something very unexpected took place. I was on to something. I begin to think through what it might be. As the card faced outwards it must signal outwards. My first thought was the delivery of money. But a system like this would be too easily spotted if looked for and would be far too much of a risk. My mind still on the side of conspiracy was reminded of the case of the chalked symbols in Italy. 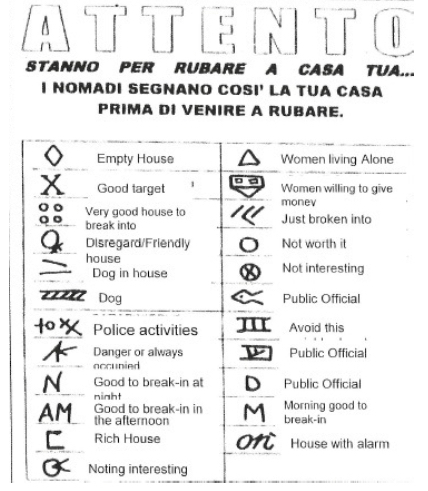 Professional burglars would chalk up a whole hieroglyphic-esque symbolic system on houses to tell other thieves about the nature of the house. Symbols would denote, ‘house with alarm’, ‘good target’, ‘single occupant’ and so on. There were reports that this system was being adopted in the UK, but there was no real proof. And it seemed like some of the public were getting these ideas mixed up with road markings laid down in spray paint on the pavement by gas and water works maintenance teams. But I knew these ideas wouldn’t hold up. 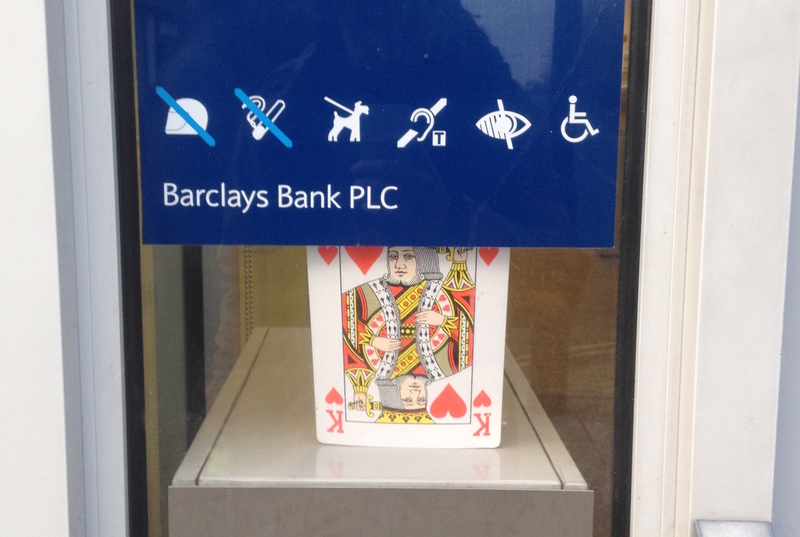 Again this would be too easily spotted, and this was more specific, I had seen these cards in no other banks apart from Barclays. It therefore must be something internal, used by the staff to signal to other staff. The next step, was to speak to someone on the inside. I knew I couldn’t just walk into a Barclay’s and ask, having seen the woman stealing the card away from my camera. I needed someone who used to work there, who may be willing to share information. After some digging into various networks, I found a member of family who knew someone , and she arranged an introduction. I tentatively asked him about the cards and he knew of them. He said when he had worked at Barclay’s, over 10 years ago, that he had used them, propped up against the front window. I asked what they signified, and he told me. But I’m afraid I am not at liberty to divulge the information that he gave me about the mystery cards, as it may be a breach of security across the country. But suffice to say it has important meaning. And if you are a Barclay’s customer, it is for your own safety. So next time you are walking past a Barlcay’s bank in the morning, take a look in the window. Who knows what you might find.